Questionable project out of Singapore that's basically a combination of breakthrough ideas from other projects, but claims to be unique. Ambitious plans and shady history. Network platform that is trying to take on the challenge of adapting blockchain technology to mainstream needs of dApp developers, regular users, and even to replace the current infrastructure of the Internet. May 5th was D Day for their Telegram channel: added around 5,000 subscribers. Which shows a high level of finding and attracting new subscribers. All team members come from COBINHOOD. Can single out 3 people: Popo Chen - founder, and two co-founders: Wei-Ning Huang and Yao-Wei Ou. Popo Chen - is their PR engine. Visited several conferences with a presentation and published a few YouTube videos. Popo Chen is also the founder of COBINHOOD, the Token Sale for which ended in October 2017 and raised around $13,000,000. Wei-Ning Huang was gaining experience at Google for 3.5 years, reaching the title of Senior Software Engineer. As far as his achievements, can note that he is an active user of OS Linux (over 6 years). Trading crypto for just under 5 years, one of the early ones in the space. Yao-Wei Ou worked in such well-known companies as Realtek and Qihoo 360. Also in his LinkedIn, he mentioned that he was the founder of Cepave (Oct 2016 – Oct 2017), which was focused on CDN and blockchain. It's interesting that Cepave began in 2015 and was working on developing scalable network applications. Cepave logo used by Yao-Wei Ou is circa 2015. Note that of all the team members, only the founder mentions the project in his social media (maybe he's keeping it secret from them). No advisors, at least no info on their site. They are probably just relying on Wei-Ning Huang, who started as an advisor at COBINHOOD and then became CTO and Co-Founder. Blockchain technology is a breakthrough, but its current architecture doesn't stand up to modern requirements. DEXON claims to have solved this problem by using blocklattice and an infinitely scalable consensus algorithm with low delay and Byzantine fault tolerance. Oh, and they want to add a crosschain there too. Btw, the team says that they introduced a novel, state-of-the-art concept of "blocklattice" - except they forget to mention that it was borrowed from Nano. The team has ambitious plans: to re-write the structure of the WWW, eliminate blockchain bottlenecks, and even create an incubator for dApp projects. Advanced platform for creating smart contracts. Multicurrency account: out-of-the-box support for several digital assets. Transfer of several tokens in one transaction. Can send different tokens to one recipient or same token to multiple recipients. Role-based access control. Used for smart contracts. They position all these features as innovative, but none really are. Their consensus algorithm is based on such concepts as: blocklattice, Reliable Broadcast Algorithm, Total Ordering Algorithm, and Consensus Timestamp Algorithm. Blocklattice: Whereas, in the classical case, all of the network's nodes form a common blockchain, here we have a mechanism where every network node builds its own chain whose blocks exchange information with similar blocks in the chains of other nodes. Because of this, a node doesn't have to wait for other nodes to generate a block. Reliable Broadcast Algorithm: simplified mechanism looks like this: when creating a new block, the node notifies (ack) other nodes' most recent blocks about it. When 2/3+1 of all nodes are notified about the block's creation, the block is considered strongly acked and is recorded into the blockchain. Total Ordering Algorithm: used for sequencing generated blocks. Consensus Timestamp Algorithm: this algorithm timestamps all the blocks to avoid dishonest node behavior, which cannot exceed 1/3 of all nodes. For a block in a selected chain, they use the median of timestamps. Infinite Scalability: achieved by using the breakthrough blocklattice technology and sharding. Low Latency: result of using non-standard structure (see blocklattice), which is not dependent on throughput, and by getting rid of PoW in favor of PoP. Fairness: Their secret is that no one can fake the sequence of transactions. Plus, the randomizer from the blocklattice is used in smart contracts. Energy Efficiency: Because they're not using PoW. Decentralization: They say this is influenced by their use of PoP (Proof-of-Participation), under which all validators have an equal voting right regardless of the size of their stake. When the number of nodes increases, DEXON will switch to Randomized PoP, which will be able to support millions of nodes thanks to an honest oracle. Looking at DEXON's consensus algorithm, we see a lot in common with Hedera. Breakthrough blocklattice used by DEXON is exactly like Hedera's hashgraph. In both cases, they use timestamps to find block order, determined by the median. Both projects are built on DAG. Hedera uses gossip about gossip, while DEXON - honest broadcast, which is in essence the same thing. Governance, sharding, etc. How does he know that Hedera's simulation doesn't process failstops if they didn't provide results of the simulation? Actor Model Parallelization: for infinite scalability of smart contracts. Honest random oracle in the smart contract: say they're adding to it a randomizer from their consensus algorithm. Updatable smart contracts: smart contract owners can update them after launch; the process is very simple and traceable. Asset Issuance Contract: necessary for using an unlimited number of digital assets in the DEXON network. These contracts are perfect for launching ICOs and crosschain transactions. Crosschain jumping contract: using the PoA (proof-of-authority) model. This model doesn't rely on staking and is fully decentralized. This contract is governed by a special committee (inter-chain bridging committee). Bridging operators - members of this committee. Transaction method: two-way peg. Two-way peg - method that doesn't imply crosschain transactions per se. Instead, during a transaction, the coins will be blocked in one chain while an equivalent amount of coins will be unblocked in another chain. Their contract system is fully compatible with Solidity. No idea why they'd need to create their own language, let alone a compiler with their own virtual machine. Honest randomizer from the consensus algorithm. In the description of their consensus, they say that DEXON provides a provably safe random oracle. Seems like they forgot to include a proof of that. Actor Model Parallelization is already used in EOS, though not as cool as here. DEXON's is infinitely scalable. They didn't provide a process for smart contract implementation. Just an announcement that it exists. "Asset Issuance Contract works for launching ICOs" is written with consideration that COBINHOOD provides ICO launch services. These contracts are also necessary for COBINHOOD to be the first to implement fully decentralized High Frequency Trading. For crosschain jumping contract also too little clarity. We just know that the idea is taken from RSK (smart contract operating platform). How will they do all of that? Who will select the inter-chain bridging committee? From whom will members be selected? All a mystery. DEXON is perfect for HFT of digital assets between various blockchains. To make this process easier, they use atomic swaps. Order Matching Model: users can place in their accounts limited orders for trading digital assets. They then need to set a fee for order matcher, which can be any user. The fastest matcher gets the commission. Liquidity Sharing Among Different Markets: user simultaneously set several orders for acquiring assets in various cryptocurrencies without dividing his account balance among several exchange markets. As you probably guessed already, they provide no details about atomic swaps. Nor about any of the other parts. Native Token: here, it's "DEX", the smallest unit of which they call "Dei". Validator Node: participates in the consensus algorithm. Responsible for validating transactions and block formation. To become a validator, node must deposit tokens. Users can support a validator by adding tokens to his deposit. The number of validators is predetermined, those whose deposit is bigger get to become validators. Governance: they have a special governance contract, which determines the maximum number of validators and the transaction fee. This contract can be changed by the DEXON governance council. All changes come OTA (over-the-air). DEXON Governance Council: originally, this will include the DEXON Foundation and a few organizations with a good reputation. In time, they will increase membership. Proof-of-Participation (PoP): they use a symmetric consensus algorithm: all validators have equal voting weight regardless of deposit size. Validators who violate the consensus algorithm will be fined a specific percentage of their deposit. Mining Rewards: validator reward is determined by the total time of active transaction validation. The validator can distribute a percentage of the reward among the users who added tokens into his deposit. Transaction Fees: The transaction's sender must pay the predetermined fee to the validator. Storage Fees: smart contract owners must pay the fee for data storage. The entire commission is passed along to validators. Gas Fees: needed for executing smart contracts. Gas expenditure for every operation is predetermined in the governance contract. Validators get paid gas in DEX tokens. IDG Capital - is among the world's top venture capital companies. They are the official partner for dApp integration. The companies invested into by IDG have a lot of daily active users and are interested in integrating with the DEXON network. Here, they offer an introduction to their over-ambitious future plans. As you can see, almost every bullet point can easily be its own project. Wonder how far into the future these are? 2018/Q3:DEXON consensus algorithm, simulation results, DEXON consensus engine SDK and PoC. 2018/Q4: Launches testnet, explorer, and wallet. 2019/Q1: DEXON mainnet goes live. COBINHOOD's token sale ended on October 23rd, 2017 and raised $13,078,406 out of the $25,000,000 they wanted to raise (52%). 0.72x USD, 0.51x ETH, 0.62x BTC. DEXON Foundation positions itself as a non-profit organization, and takes pains to underline that they are not doing an ICO, but will rather airdrop DEX tokens to those holding COB. At the same time, they signed a financial partnership with IDG Capital. On DEXON's site there is an open registration for private sale. But the most interesting part is that DEXON itself is part of COBINHOOD's roadmap (Decentralized Exchange Online) and was supposed to have been implemented in Q2 2018. And, as the cherry on the top, here's an interesting story. During the COBINHOOD's ICO, some investors got 2x, and Ian Balina even got 3x. And this would be all good, except they started to sell their tokens on EtherDelta before the ICO even ended, at a lower price too. The team had to stop the ICO and issue a public apology. Ouch. Q: Who forms the inter-chain bridging committee? Who's part of bridging operators? Q: What about sending different coins to different recipients in one transaction? Q: Which companies specifically will be on the Governance Council? Q: Which companies from IDG's investment portfolio are interested in developing dApps on your platform? Which specific offers did you already receive? Q: What's the size of the fine for validators who violate the consensus algorithm? Q: What's the advantage of using the fines system vs. liquidating the entire deposit and blocking the dishonest validator? Q: How do you protect against cases when the fine is lower than the profit from violating the consensus algorithm? Q: So does the validator receive an award from his active time of validating transactions or from total time of all validations + the space it gives for storing smart contract data + gas from smart contracts? Q: What's the formula to determine the fee for using the storage space by a smart contract? Q: Why do they COBINHOOD and IDG Capital websites not have any official announcements about the partnership? Questionable project with plenty of skeletons in its closet, which at this point is merely a conceptually project. Can't wait for their PoC and SDK. The team is trying to make the project sound unique, but the truth is that they borrowed the basis from competitors. Their ambitious future plans coupled with the warning in the beginning of their WP (we are describing our vision but not guaranteeing its practical implementation because of possible unforeseen situations) makes us nervous. Спорный проект из Сингапура, который по сути своей является комбайном прорывных идей из других проектов, но с претензией на уникальность. Амбициозные планы и мутные истории из прошлого. Сетевая платформа, которая вызвалась решить задачу адоптации блокчейн технологий под массовые потребности как разработчиков децентрализованных приложений, так и рядовых пользователей, а также посягнула на существующую структуру Интернета. telegram 9 590 members и это число потихоньку сокращается. 5 мая для telegram канала - день x. На канал прилетело порядка 5 000 подписчиков, что в свою очередь является показателем высокого уровня проведенной работы по поиску и привлечению целевой аудитории проекта. Все члены команды - выходцы из COBINHOOD. Здесь можно выделить 3 основные персоны: Popo Chen - founder и два Co-Founder: Wei-Ning Huang и Yao-Wei Ou. Popo Chen - основная машина пиара, успел посетить несколько конференций с докладами, выпустить пару роликов на YouTube. Popo Chen также является основателем COBINHOOD, Token Sale которого закончился в октябре 2017 и собрал порядка $13,000,000. Wei-Ning Huang, в течении трех с половиной лет набирался опыта в Google, за это время дорос до Senior Software Engineer. Из достижений можно отметить тот факт, что он является активным пользователем OS Linux и работает с ней на протяжении уже долгих 6 лет. Трэйдит криптой чуть меньше: 5 лет, фактически стоял у ее истоков. Yao-Wei Ou, поработал в таких известных компаниях как Realtek и Qihoo 360, также в своем профиле в LinkedIn он указал, что был основателем Cepave (Oct 2016 – Oct 2017), которая фокусировалась на CDN and blockchain. Интересно то, что компания Cepave начала свое существование в 2015 году и занималась разработкой широкомасштабных сетевых приложений. И логотип Cepave, который использует Yao-Wei Ou, принадлежит компании образца 2015. Примечателен тот факт, что никто из членов команды, кроме ее основателя, не ассоциирует себя с проектом, возможно, он держит его от них в тайне. У проекта нет advisors, по крайней мере на сайте нет никакой инфы. Скорее всего, они обходятся за счет мастерства Wei-Ning Huang, который начал адвизором в COBINHOOD, а потом стал CTO and Co-Founder. Технология блокчейн - прорыв, но с использованием текущей архитектуры она не отвечает современным требованиям. DEXON заявляет, что они решают это проблему за счёт использования blocklattice, а также бесконечно масштабируемого алгоритма консенсуса с низкими задержками и византийской отказоустойчивостью. Ну и еще они хотят приурктить кроссчейн. К слову, команда заявляет, что они ввели ранее не существовавший (novel) ультрасовременный (state-of-the-art) термин blocklattice. Но забыли указать, что он был позаимствован у проекта Nano. Команда ставит перед собой амбициозные планы: перепилить структуру глобальной сети, убрать узкие места блокчейна и создать инкубатор DApp проектов. Все эти фичи позиционируются как инновационные, но по сути своей таковыми не являются. Алгоритм консенсуса опирается на такие понятия как: blocklattice, Reliable Broadcast Algorithm (алгоритм надежного бродкаста), Total Ordering Algorithm (алгоритм полного упорядочения), Consensus Timestamp Algorithm (алгоритм консенсуса временных меток). Blocklattice: если в классическом случае все ноды сети формируют общий блокчейн, то здесь мы имеем механизм, где каждая нода сети строит свою собственную цепочку, блоки которой обмениваются информацией с такими же блоками в цепочках других нод. Благодаря этому, для генерации нового блока нода не должна ждать остальных. Reliable Broadcast Algorithm: упрощенный механизм выглядит следующим образом: при создании нового блока, нода оповещает (ack) об этом последние блоки из других нод. Когда о создании блока оповещено 2/3+1 от общего числа нод, то этот блок считается strongly acked и записывается в блокчейн. Total Ordering Algorithm: используется для упорядочивания генерируемых блоков. Consensus Timestamp Algorithm: этот алгоритм проставляет временные метки на все блоки для того чтобы избежать поведения нечестных нод, общее количество которых не должно превышать 1/3 от общего количества. Для блока в выбранной цепи используется медиана временных меток. Infinite Scalability (бесконечная масштабируемость): достигается за счёт использования прорывной технологии blocklattice, а также использования шардинга. Low Latency (низкие задержки): являются следствием использования нестандартной структуры (смотри blocklattice), которая не зависит от пропускной способности, а также отказом от PoW в сторону PoP. Low Transaction Fees (низкая комиссия по транзакциям): алгоритмы, которые работают на PoW, берут большую комиссию за проведение транзакции. Поскольку DEXON не базируется на PoW, то и комиссия будет минимальной. В WP авторы пишут, что по их ожиданиям она будет меньше чем 0.000000001 USD. А уже в телеграм канале проекта Founder заявляет, что комиссия будет определяться механизмом свободного рынка. Fairness (справедливость): секрет кроется в том, что никто не может подделать последовательность транзакций, а еще рандом из blocklattice используется в смартконтрактах. Energy Efficiency (энергетическая эффективность): за счет того, что не используется PoW. Decentralization (децентрализация): по заявлению авторов, на этот показатель влияет использование PoP (Proof-of-Participation), при котором все валидаторы обладают равным правом голоса в независимости от стейка. При увеличении количества нод DEXON перейдет на Randomized PoP, который сможет поддерживать миллионы нод за счет честного оракула. И там и там используются timestaps для нахождения порядка блоков, которые рассчитываются по медиане. Оба проекта построены на DAG. Hedera использует gossip about gossip, а DEXON - честный броадкаст, что по сути свой практически одно и тоже. Governance, sharding и много другое. Откуда же он знает, что симуляция Hedera не обрабатывает фэйлстопы, если они не предоставили результаты симуляции? Actor Model Parallelization: для бесконечной масштабируемости смарт-контрактов. Честный рандомный оракул в смарт-контракте: пишут, что они сюда прикручивают рандом из алгоритма консенсуса. Обновляемые контракты: владельцы смарт-контрактов могут их обновлять после выпуска, процесс очень легкий и отслеживаемый. Asset Issuance Contract: необходим для использования неограниченного числа цифровых активов в сети DEXON. Эти контракты прекрасно подходят для запусков ICO и кроссчейн транзакций. Контракт кроссчейн проброса: используется модель PoA (proof-of-authority). Данная модель не зависит от стейка и полностью децентрализована. Этим контрактом управляет специальный комитет (inter-chain bridging committee). Bridging operators - члены этого комитета. Метод транзакций: two-way peg. Two-way peg - метод, который не подразумевает кроссчейн транзакций в чистом виде, вместо этого при проведении транзакции монеты будут блокироваться в одном чейне, а эквивалентное им количество разблокируется в другом чейне. Их система контрактов полностью совместима с Solidity. Для чего нужно пилить свой язык не понятно, а тем более компилятор с виртуальной машиной. Честный рандом из алгоритма консенсуса. В описании конченсуса написано, что DEXON обеспечивает доказуемо безопасный случайный оракул. Доказательства этому, скорее всего, просто забыли предоставить. Actor Model Parallelization уже используется в EOS, но не такой крутой как здесь, у DEXON бесконечно масштабируемый вариант. Процесса реализации обновления смарт контрактов не представлено, команда ограничилась только заявлением о его наличии. "Asset Issuance Contract подходит для запуска ICO" написано с прикидкой того, что COBINHOOD предоставляет услуги по запуску ICO. Также эти контракты нужны для того чтобы COBINHOOD был первым, кто внедрил полностью децентрализованный высокочастотный трейдинг ( High Frequency Trading). Про контракт кроссчейн проброса тоже мало что ясно. Известно только, что идея взята у RSK (опенсорсная платформа смартконтрактов). Как они все это сделают, кто будет выбирать inter-chain bridging committee, из кого он будет выбираться - это загадка. DEXON прекрасно подходит для HFT цифровыми активами между разными блокчейнами. Для облегчения этого процесса используется atomic swap. Order Matching Model: пользователи могут размещать у себя в аккаунте ограниченную заявку на торговлю цифровыми активами. Далее необходимо установить комиссию для order matcher (сортировщика заявок), им может стать любой пользователь. Наиболее быстрый сортировщик получит комиссию. Liquidity Sharing Among Different Markets: пользователь может одновременно формировать несколько заявок на приобретение активов в разной криптовалюте без разделения баланса на своем аккаунте среди разных рынков обмена. Как вы уже успели догадаться, никаких подробностей по atomic swap нет, по остальному аналогично. Native Token: здесь это "DEX", минимальная его единица называется "Dei". Validator Node: участвуют в алгоритме консенсуса, отвечают за валидацию транзакций и формирование блоков. Для того чтобы стать валидатором необходимо внести токены на депозит. Пользователи могут поддержать валидатора, закинув токенов на его депозит. Количество валидаторов предопределенно, а становятся ими те, у кого размер депозита больше. Governance: здесь есть специальный governance contract, который и определяет максимальное количество валидаторов, а так же комиссию за транзакцию. Изменять этот контракт может DEXON governance council. Все изменения прилетают по OTA (по воздуху). DEXON Governance Council: изначально, сюда будет входить DEXON Foundation и несколько предприятий и организаций с высокой репутацией. С течением времени, количество мест будет увеличено. Proof-of-Participation (PoP): используется симметричный алгоритм консенсуса: все валидаторы обладают равновесным голосом вне зависимости от депозита. Валидаторы, нарушающие алгоритм консенсуса будут оштрафованы на определенный процент от депозита. Mining Rewards: вознаграждение валидатору прилетает от общего времени активной валидации транзакций. Валидатор может распределить процент от вознаграждения среди пользователей, которые закинули токены в его депозит. Transaction Fees: отправитель транзакции должен платить предустановленную комиссию валидатору. Storage Fees: владельцы смартконтрактов обязаны платить комиссию за хранение данных. Вся комиссия перечисляется валидаторам. Gas Fees: нужен для выполнения смартконтрактов, расход газа на каждую операцию предустановлен в governance контракте. Газ выплачивается валидаторам в DEX. IDG Capital - входит в топ мировых венчурных компаний. Официальный партнер поинтеграции DApps. Компании, в которые проинвестировал IDG, обладают огромной ежедневной пользовательской активностью и заинтересованы в интеграции с сетью DEXON. В этом разделе команда предлагает ознакомиться с их сверхамбициозными планами на будущее. Как вы видите, практический каждый из пунктов тянет на отдельный проект. Интересно, насколько далеко в будущее смотрят эти планы? 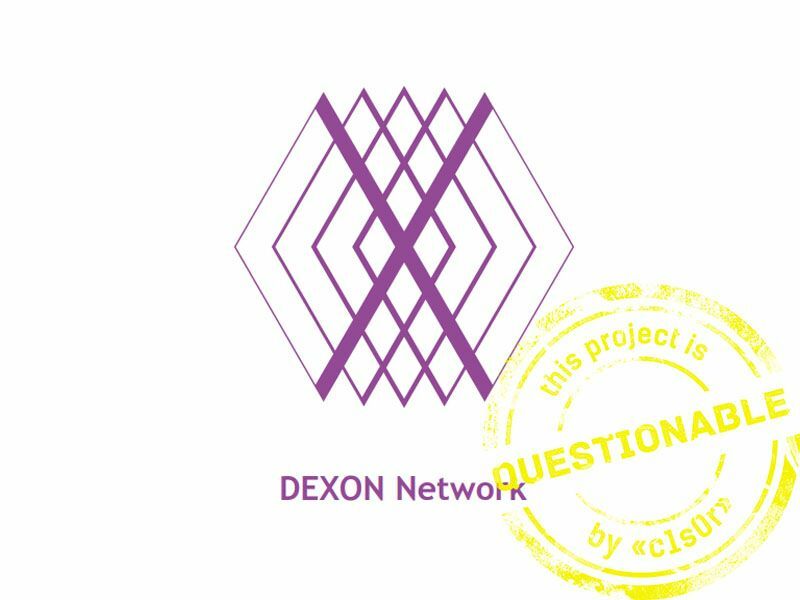 DEXON Foundation позиционирует себя как некоммерческая организация и всячески подчеркивает, что они не проводят ICO, а токены DEX упадут эирдропом владельцам COB. При это было заключено финансовое партнерство с IDG Capital, а на сайте проекта открыта регистрация на DEXON private sale. Но самое интересное - это то, что DEXON является частью roadmap COBINHOOD (Decentralized Exchange Online) и должен был быть реализован во втором квартале 2018. Ну и на десерт такая история. При проведении ICO некоторые инвесторы получили со старта 2x, а Ian Balina все 3x. И все бы ничего, только вот они начали скидывать эти токены на EtherDelta еще до окончания ICO по более низкой цене. Команде пришлось приостановить ICO и публично раскаяться. Q: Кто формирует inter-chain bridging committee? Кто входит в состав bridging operators? Q: Что насчет передачи разных монет разным получателям одной транзакцией? Q: Кто конкретно будет входить в Governance Council (имена компаний)? Q: Какие компании из инвестиционного портфеля IDG заинтересованы в разработке DApps на вашей платформе? Какие конкретные предложения уже поступили? Q: Какой размер штрафа при нарушении валидатором алгоритма консенсуса? Q: В чем заключается превосходство использования системы штрафов над ликвидацией всего депозита и блокировки нечестного валидатора? Q: Как вы защищаетесь от случаев, когда размер штрафа ниже, чем выгода от нарушения алгоритма консенсуса нечестным валидатором? Q: Так всё-таки, валидатор получает награду от времени активной валидации транзакций или от их суммарного количества + предоставленное место для хранения информации смартконтракта + газ по смартконтрактам? Q: Какая формула расчета комиссии за используемое дисковое пространство смартконтрактом? Q: Почему на сайтах COBINHOOD и IDG Capital нет официального заявления о партнерстве? Вызывающий вопросы проект со своими скелетами в шкафу, который, на данный момент, представляет из себя исключительно концепцию. С нетерпением ждем PoC и SDK. Команда пытается придать проекту индивидуальность, но правда заключается в том, что база для его создания была позаимствована у конкурентов. Наполеоновские планы на будущее в сочетании с предостережением в начале вп (мы описываем свое видение, но не гарантируем его практическую реализацию, ввиду возможного возникновения непредвиденных ситуаций) невольно наводит на определённые мысли.